Foster the love of texture with these pants. The jacquard features a metallic sheen and a structured profile for seamless style. Match it to the coordinating topper or rotate it with other staple tops and jackets. 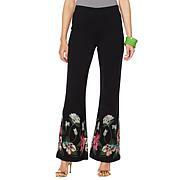 These are beautiful pants!! They are definitely not for the shy person as they represent the great Iris Apfel style. (You know, "More is more and less is a bore") They do not have any stretch in them, of course, so be sure to order your correct size. I am usually a 2 in most pants but a size 4 in these is perfect. Iris, your are a genius! These pants are beautiful and the quality is amazing. Well worth the price. 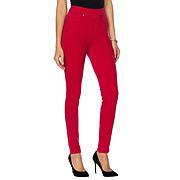 The problem with the pants are that they are not cigarette pants, they look much closer to a straight leg pant. 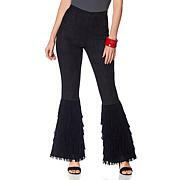 Also I'm 5'5" and these pants came below the ankle so I could not achieve the look on the model. These pants would be perfect if the leg cut was slimmer and a petite version was offered.